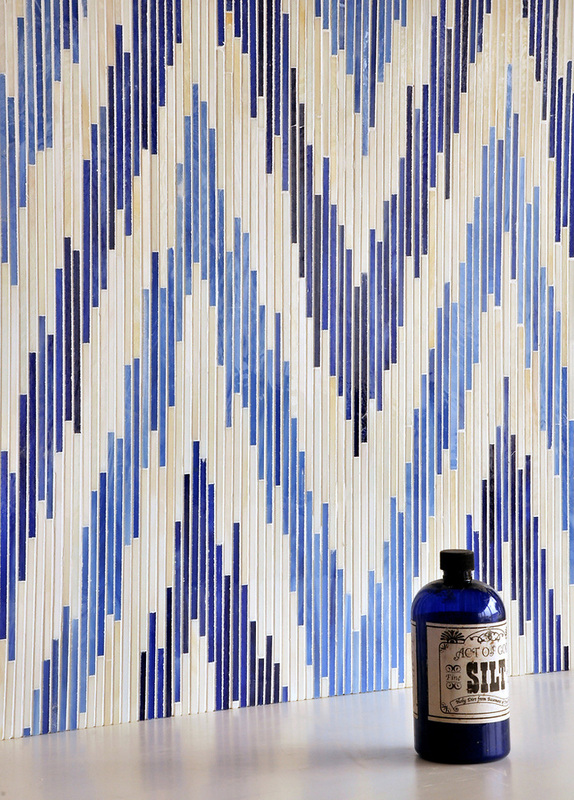 Inspired by the ancient Ikat textiles of Asia and South America, designer Sara Baldwin has creatively translated the textile designs into glass mosaic tiles for New Ravenna Mosaics. For an imaginative, sustainable, and durable glass mosaic tile surface, New Ravenna Mosaics now offers Ikat in jewel glass tiles for vertical surfaces. Ikat, which comes from the Malay word “mengikat,” meaning to tie or bind, is a resist-dyeing process that has been used for centuries in India, Japan, Southeast Asia and South America, notes the company. The earliest surviving piece of Ikat fabric is from Japan, dating from the first century. Baldwin’s inspiration for the Ikat mosaic tiles came from her travels along the Silk Road, a network of interlinking trade routes across the Afro-Eurasian landmass, and her personal collection of Ikat textiles. The result: mosaic tiles that capture the classic patterns of Central Asian Ikat textiles with the glitter of reflective glass and mirror for New Ravenna’s glass mosaic tile collection. Pamir, in three colorways, is a graphic symbol of the Pamir mountain range in Central Asia. The zigzag design is reminiscent of the steep peaks of this high mountain range, which has been called the Roof of the World since Victorian times. The three New Ravenna glass mosaics patterned after the Ikat textiles are Pamir, Loom and Weft, each in vibrant, distinct colorways. The Ikat Collection is handcrafted in Virginia and created in a seamless, repeat pattern for interior vertical surfaces. Loom, in Quartz, Aquamarine, Tanzanite, and Turquoise glass, celebrates the vibrant color and geometric designs found in contemporary Ikat textiles. Weft, named for the horizontal threads in Ikat fabric, is a subtle palette of Quartz and Labradorite glass inspired by Uzbekistani leaf patterns. Facilities executives searching for distinctive products such as the Ikat Collection for their interior spaces can achieve a work-of-art quality for otherwise bland vertical surfaces. For new projects as well as to rejuvenate time-worn existing spaces, facilities executives can guide and work with their in-house designers or contracted design firms with results that can inspire workers and convey an upbeat note to visitors.